This is an ultra fast paced action game, with instant-kill combat.Destroy your enemies by fighting like a badass Ninja Warrior!Player 1 has to be taken for choosing the game mode! - Added custom selection circle for better visibility. - Buffed 'Firebomb' like always. This game is a quick, minigame with super fast, instant kill combat. It is easy to learn but has a big potential for skill improvement, since it is mostly reaction based. This makes the map ideal for a quick fun match with friends. Use abilities like mighty shockwaves or deadly shurikens to defeat your foes and dodge their attacks with teleporting skills and good timing. The aim is to eliminate the enemy team 10 times. My main inspiration was the Dota 2 map with the same name. 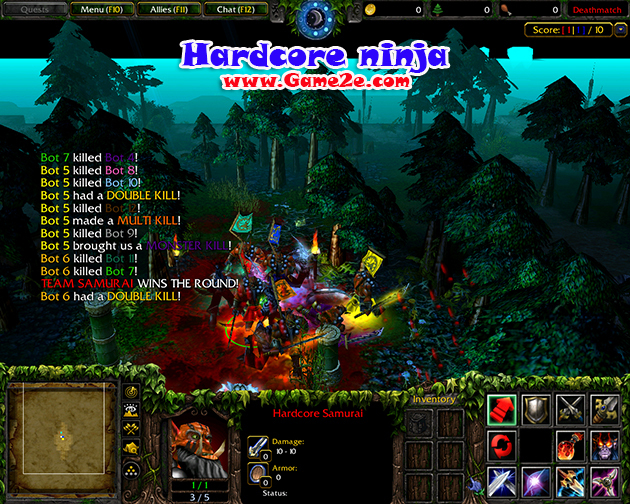 My aim was to create the fastes and smoothest combat, possible to create in Warcraft III. Custom visual effects and sounds, increase the impact of the combat and the players are rewarded by gaining achievements for well executed fights.Future plans are implementing more abilities, game modes (capture point) and arenas.